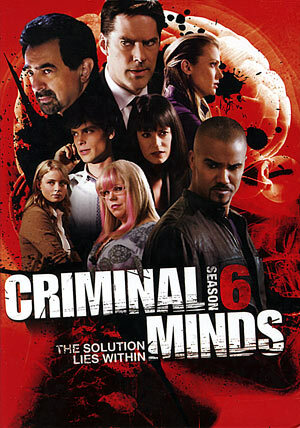 “Criminal Minds” Season 6 isn’t nearly the best the series has had to offer but it’s still pretty damn entertaining. The writing is crisp and given the turmoil of two main cast members making their exits, I’m impressed that they were to keep some consistency. Like the seasons 3-5, we get more and more team-centric character arcs to balance the crime-drama stories. “Criminal Minds” enters its sixth season after a very dark season five in which “The Reaper” brutally murders Agent Hotchner’s wife because Hotch refused his offer to stop hunting him down. Now we enter season six off with the conclusion to the cliffhanger in which “The Prince of Darkness” (TIM CURRY) has killed an L.A. detective right in front of his family and Agent Morgan (SHEMAR MOORE). This storyline comes back a few times throughout the season as Morgan has taken upon himself to care for the slain detective’s daughter making sure she is safe. She gets placed in an abusive foster home and runs away back to D.C. where Morgan struggles with what to do. It’s one of the finer episodes of the season with a good conclusion to the storyline. Other changes occur this year as the producers felt things needed to be shaken up and the bean counters wanted to cut down costs. First, in the episode ‘JJ’, J.J. (A.J. COOK) takes a job as liaison within the Department of Defense, after being offered the position twice before. It’s a good episode though still a rushed departure for a well liked character however it does lead to some good character interactions especially from Garcia (KIRSTEN VANGSNESS) who tries to fill JJ’s shoes by becoming both media liaison and techno goddess. Then we get a multi-episode story arc centered on Emily Prentiss (PAGET BREWSTER) as her covert past comes back to haunt her when a former IRA terrorist (TIMOTHY V. MURPHY), with whom she had an intimate undercover relationship with, escapes from a North Korean prison – sent there by her and colleagues within a shadowy multi-country organization – and discovers she is still alive and assuming a new name. This not only means she’s in danger but the BAU team could be targeted. Her storyline at times does feel tacked on but I’m sure the writers didn’t know she would be leaving until after the season already began and given that difficulty, they came up with at least a half decent plot and good way for her exit… until the clichéd and obvious reveal just in case the producers made the wrong choice in firing her; which they did since she’s set for return in season 7, along with A.J. Cook. Speaking of Cook, her departure came early on in the season and — spoiler warning — she makes a couple reappearances during Prentiss’s storyline. Well, about midway through we get introduced to a character named Ashley Seaver and the background they gave her was unique — her father was a serial killer — but the execution of the character was kind of bland. One could attribute this to Rachel Nichols but I’m cutting her some slack for being placed in a difficult position in coming into a show in its sixth season and in the middle no less, replacing a popular character. Basically her character doesn’t amount to much and given her short 13 episode stint, never had the opportunity to. Based on what I’ve read, Seaver won’t be around next year. Season six of “Criminal Minds” is hardly the best but there’s still some solid writing throughout the year. I like that they continue to place focus on the team aspect rather than having one take the bulk of time, giving each character their own arc. The killers and their motives are fresh even if they draw heavy inspiration from other sources (i.e. “The Thirteenth Step” is a take on Natural Born Killers). My only big complaint is that the cliffhanger isn’t nearly as good as season five’s (with Tim Curry as The Reaper) but it hopefully will lead to another solid run in its seventh season. The 6-disc DVD set is held in 3 thin-line cases (2-discs per case) and housed in a card board matted slip case. The artwork on each is the same as the outer case. Greg St. Johns’ CMS6 Yearbook (2:57) – This is more a photo gallery of pics taken, presumably by DP Johns, throughout the season. Crime Scenes Featurettes (TRT 15:46) – There are several (4 to be exact) featurettes on various episodes which contain sound bites from cast and crew and behind-the-scenes footage. Each takes a look at some elements about the episode such as stunt work or storylines. From Script to Screen: Agent Down (16:53) takes a look at Prentiss’ storyline and exit from the series from the perspective of the writers who had the challenge of putting together the story. It also contains comments from the crew and some behind-the-scenes footage. Secrets: Making “Criminal Minds” Season 6 (16:27) is a good and well rounded featurette covering the season as a whole. As you might guess, there are more behind-the-scenes footage with some comments with the cast and crew. Deleted Scenes (TRT 8:25) – Here we get scenes from 6 episodes that were removed for one reason or another (no doubt time constraints). Nothing here is that interesting but they’re still good to have and watch. Gag Reel (2:38) contains line flubs and character breakdowns and on-set antics. “Criminal Minds” The Sixth Season is presented with a good looking 1.78 anamorphic widescreen transfer. The colors are well balanced and I didn’t notice much in the way of artifacting or pixilation. I can’t say it’s a brilliant looking DVD or comparable to the 1080i HD version that airs on CBS and A&E, but certainly good enough. The Dolby Digital 5.1 track is fair but unremarkable and in fact a tad soft at times. That said, the dialogue is easy to understand while any audio effects, like gunfire or explosions, doesn’t have that oomph I expected. Overall, “Criminal Minds” Season 6 isn’t nearly the best the series has had to offer but it’s still pretty damn entertaining. The writing is crisp and given the turmoil of two main cast members making their exits, I’m impressed that they were to keep some consistency. Like the seasons 3-5, we get more and more team-centric character arcs to balance the crime-drama stories. As for the DVD, the audio and video are adequate while the features are lackluster.